This was a major international conference hosted by La Trobe University to mark the 50th anniversary of the United Nations. the conference, convened by Joseph Camilleri, examined issues relating to democracy, security and regionalism, with a focus on the Asia-Pacific region. The conference brought together sdome fo the world's leading scholars, policy-makers and NGO representatives to examine the UN's structure, performance and agenda. the opening address was given by the Australian Foreign Minister, Senator Gareth Evans. Reflections in anticipation of the issues to be canvassed at the Conference were published in the La Trobe University June 1995 Bulletin. See below. 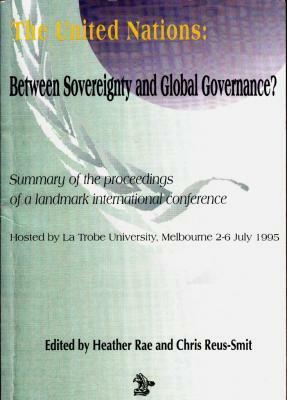 For a summary of the proceedings of the Conference see The United Nations: Between Sovereignty and Global Governance: report on the International Conference held at La Trobe University, Melbourne 2-6 July 1995. Edited by Heather Rae, Christian Reus-Smit and Lara Bancroft Melbourne VIC, Australia: School of Politics, La Trobe University, 1995.